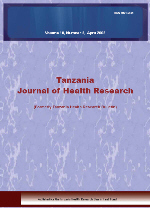 en How rational are indications for emergency caesarean section in a tertiary hospital in Tanzania? The rate of caesarean section (CS) at Muhimbili National Hospital (MNH) in Tanzania has been on progressive increase for past three decades. Concerns have been raised if this increase is justified by rational decisions but no study so far has investigated this problem. The aim of the study was to find out whether decisions made for CS comply with a set of locally made standards, with an assumption that if the standards are met, then the increase in CS rate seen at MNH is genuine. The five most common indications for CS were identified from the obstetric electronic data base. Most common indications included obstructed labour, cephalopelvic disproportion (CPD), failure to progress, repeat CS and foetal distress. Criteria for the best practice for each indication were developed based on the National guidelines and local expert consensus. Information extracted from the case notes, antenatal cards and partographs were compared to the standard audit criteria and the decision judged as standard or substandard. Three hundred forty five women had a decision made for emergency CS. Repeat CS was the most frequent indication (30.2%), followed by obstructed labour (14.4%) and foetal distress (13.6%). Audit of 324 women’s files showed that 30% of women had substandard decisions for CS mostly in the foetal distress group (59.1%) and least in the repeat CS group (9.1%). Among the 324 mothers with decision for emergency CS, 279 (86.1%) delivered by CS as decided and 45 (13.9%) delivered vaginally before CS could be performed. Women who delivered vaginally after decision for CS and the nulliparous women had significantly more substandard decisions compared to those delivered by CS and parous women respectively. In conclusion, a substantial proportion of decisions for emergency CS made in the hospital is substandard and may contain women in whom surgical intervention could be avoided. This calls for a need to improve quality of assessment and decision before performing CS.